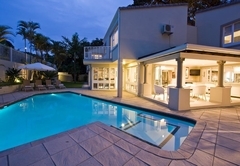 Forest Manor Guesthouse is a 5 star graded guest house offering Umhlanga Rocks accommodation in 7 guest rooms. 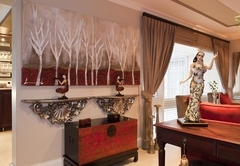 Located in Umhlanga Rocks, Forest Manor Guesthouse is just minutes from La Lucia Mall, the surrounding office parks and Gateway Theatre of Shopping. 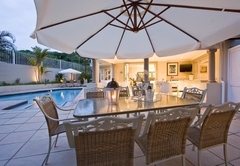 Durban and the ICC are only 15 minutes drive away and there is easy access to top class golf courses and restaurants. 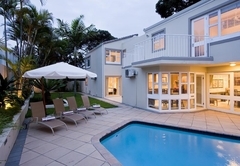 Forest Manor Guesthouse is a stroll away from the beach. 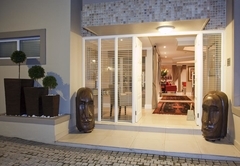 The guest house has safe and secure parking, an established garden and a swimming pool. 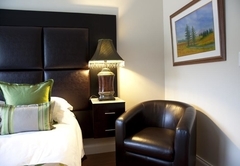 All rooms at Forest Manor Guesthouse are offered on a bed & breakfast basis. 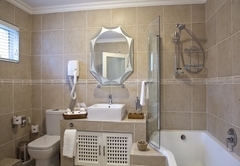 Each en-suite bathroom has a heated towel rail, towels, bath robes and slippers. 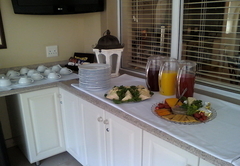 Room facilities include aircon, a fan, DStv and DVD / CD player, Wi-Fi and a mini bar. In addition there is a laptop safe and hospitality tray. 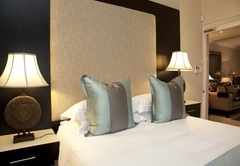 The room is furnished with a Queen-size bed dressed in cotton percale linen. The en-suite bathroom has a shower. 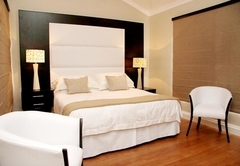 The room features an extra length King-size bed dressed in cotton percale linen. The en-suite bathroom has a bath / shower combo. 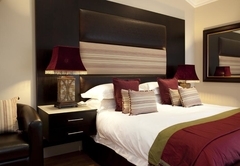 This room has an extra length King-size bed and two single beds. The en-suite bathroom has a bath / shower combo. 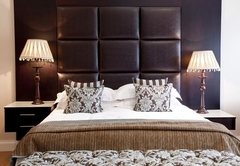 The suite is furnished with an extra length King-size bed dressed in cotton percale linen. The en-suite bathroom has a bath / shower. This suite is large and luxurious with a state of the art bathroom which includes a spa bath, separate shower and his and hers basins. 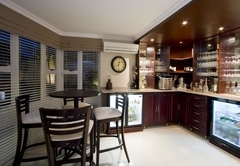 There is an adjoining private lounge with full DStv. 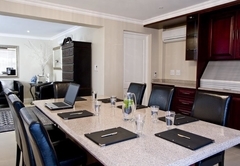 The suite can make use of the 12 seater boardroom and private patio. 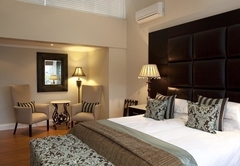 The room features a Queen size Bed, Cotton Percale linen, aircon, fan, DSTV, DVD/CD, wireless connection, mini bar, laptop safe and hospitality trays. 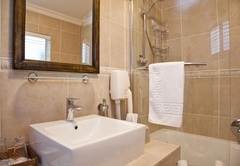 En-Suite has Shower only, heated towel rail, hair/body dryer, towels, bath robes and slippers. 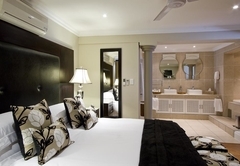 The room features a King Extra Length Bed,Cotton Percale linen,aircon,fan,DSTV,DVD/CD,wi-fi,mini bar,laptop safe and hospitality tray.En-Suite has bath/shower combination,heated towel rail,hair/body dryer,towels,bath robes & slippers. 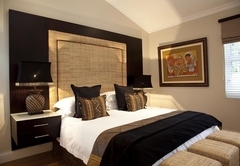 The room features a King Extra Length Bed + two single beds,Cotton Percale linen,aircon,fan,DSTV,DVD/CD,wi-fi,mini bar,laptop safe and hospitality tray.En-Suite has spa bath & seperate shower,heated towel rail,hair/body dryer,towels,bath robes & slippers. 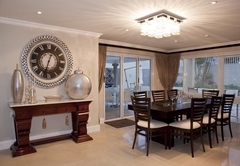 The Manor Suite is a large, luxurious suite with a state of the art bathroom. 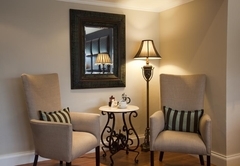 Spa bath, separate shower, his and hers basins.The Manor suite has it's own adjoining private lounge with full Dstv as well as the use of the 12 seater boardroom. 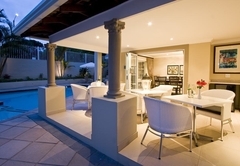 Private patio. Response timeForest Manor Guesthouse typically responds to requests in 5-10 minutes.